The compiler has been added to the aforementioned, so that you can execute the programs, along with suitable examples and sample outputs. 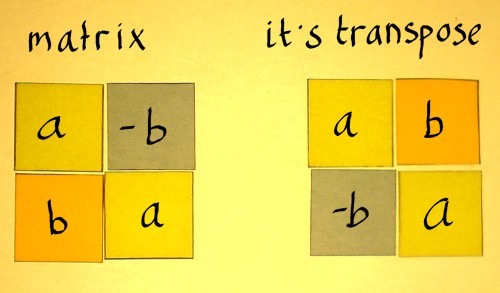 The Transpose of a given matrix is an operator which flips it over its diagonal. The order of the matrix changes unless it is a square matrix. The transpose of a transpose of a matrix is the given matrix itself – Check to Add two matrices. 1) Transpose matrix will formed by inter changing the rows and columns of the original matrix . 2) Read the row number and column number and insert the elements in to the array mat1 using two for loops. for i=0 to i<row. for j=0 to j<col. insert element at mat[i][j]. 3) To transpose the matrix, row>col then n=row /row<col then n=col. for i= 0 to i < n. for j= i+1 to j < n. Interchange the elements a[i][j] to a[j][i] and vice versa. 4) Print the transpose matrix using two for loops. for i=0 to i < col. for j=0 to j< row. print mat[i][j]. 1) Insert the elements into the matrix mat1 using while loop. a) The while loop iterates until i<row increases the i value. Inner loop iterates until the condition j<col is false. Insert the element at mat1[i][j]. Increase the j value. 2) Now We are finding the transpose of mat1. If row>col then n=row otherwise n=col. while loop iterates until i<n. j=i+1. while loop iterates until j<n. interchange the elements mat1[j][i] to mat1[i][j] vise versa. increase the j value. increase the i value. 3) Print the transpose of a matrix using two while loops with conditions i < col, j < row. then check the condition. This loop iterates until j<col. increase the i value. Then check the condition i<row. This loop iterates until i<row. 2) To transpose the matrix- row>col then n=row else n=col. i=0. do loop j=i+1. do loop. interchange the elements mat1[i][j] to mat1[j][i], increase the j value. Check the condition j<n at while. This loop iterates until i<n condition is false. Increase the i value. Then check the condition i<n at while. This loop iterates until condition i<n is false. 3) Print the transpose of the matrix using two do the loop where inner loop checks the condition j<row, outer loop checks the condition i<col.